Massive 3D Print Expo innovational event will take place in about four months, so organizers are actively involved into selling booths and preparing a lot of pleasant surprises for participants and visitors. 3D innovations became one of the most popular technological trends in the last couple of years that could revolutionize almost every industry: art, cuisine, healthcare, education etc. Today innovational technologies market is aimed at 3D printing extensively. This is proven by the 3D Print Expo buzz. 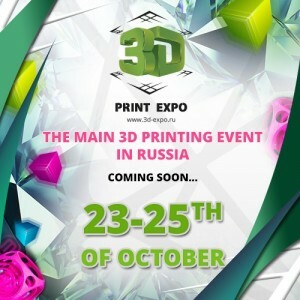 Second advanced 3D printing and scanning technologies exhibition, 3D Print Expo, will take place on 23-25 of October, 2014, in ECC Sokolniki. Major companies have already joined exhibitors list: Megapolis Group, 3D Market, 3dquality.ru, Tsvetnoi mir, 3Dtoday, 3D.RU, RGT-Russia,SIU System,CSD, Picaso 3D, David 3D,Prototypster, Bake It, Energy 3D, Fabbers etc. They will demonstrate their innovational equipment and the process of three-dimensional printing and scanning. You’re still not in that list? Then hurry up to find your place! As part of 3D Print Expo, we are planning to establish roundtables, conference, workshops, chocolate festival and art studio. Follow our updates and be the first to find out about 3D Print Expo news! 3D Print Expo is a unique event on the Russian innovational tech market, expanding amazing 3D printing and scanning possibilities. Event participants include large companies, online retailers, services etc. involved into manufacturing and selling of 3D printing and scanning equipment.